Cinque Torri (Five Towers) is a magical place in the Alps of NE Italy (The Dolomites) where hiking, climbing, skiing, and history spectacularly converge. 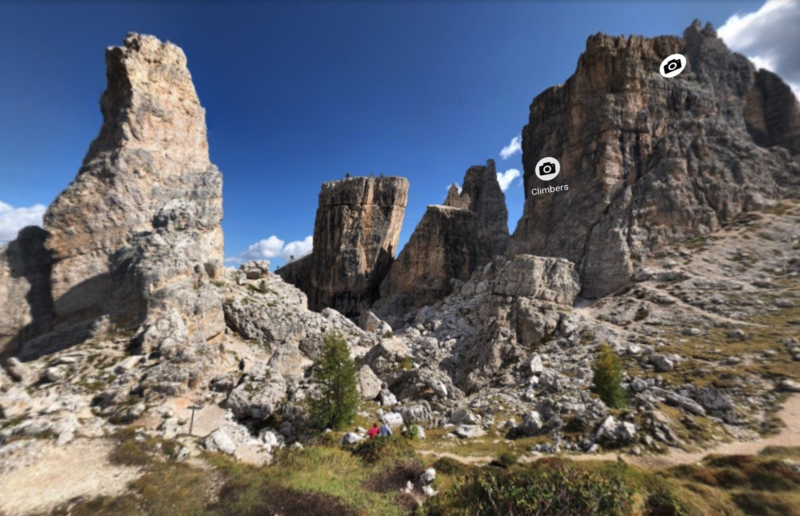 Explore this panoramic 360 vista of this remarkable area near the town of Cortina D’Ampezzo. 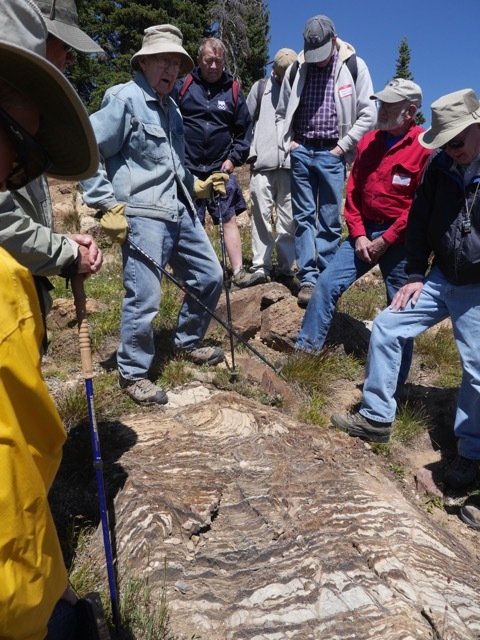 Field trip participants from the Northern Colorado Geologists group listen to Dr. Donald Boyd, Professor Emeritus of Geology from the University of Wyoming offer his thoughtful interpretations on the depositional origin of the Precambrian Nash Fork Formation stromatolites. I had the privilege, once again, to participate in a unique field trip with fellow scientists and friends to visit a fascinating geologic site in southern Wyoming. To be sure, a geologic field trip is always about ancient time travel, but this was truly remarkable. Our excursion offered us an extremely distant target: 2 billion years in time yet only 2 hours on the highway from Fort Collins. 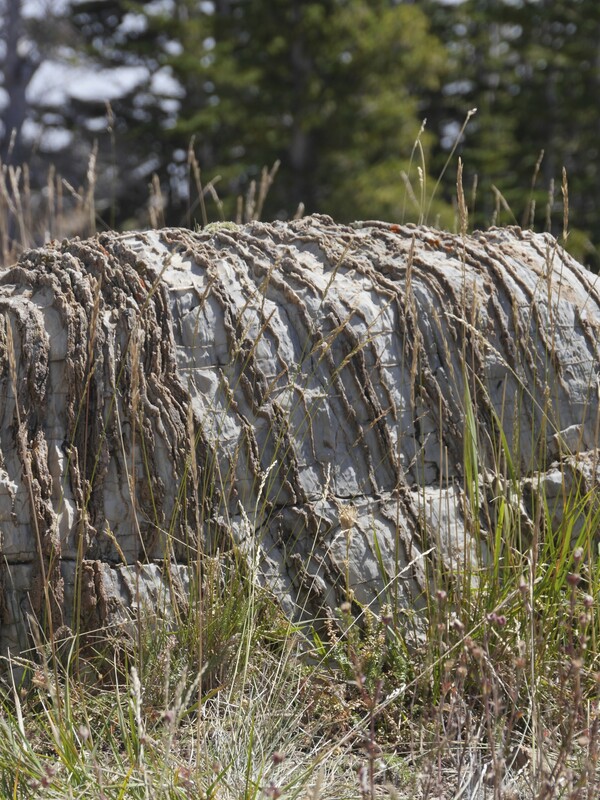 Our destination were the Precambrian-aged stromatolites of the Medicine Bow Mountains which in simple terms are– well– rocks that contain fossil slime. Fossil slime? Yes but really, really old fossil slime that was the dominant life form on our planet for more than half of earth’s entire existence! 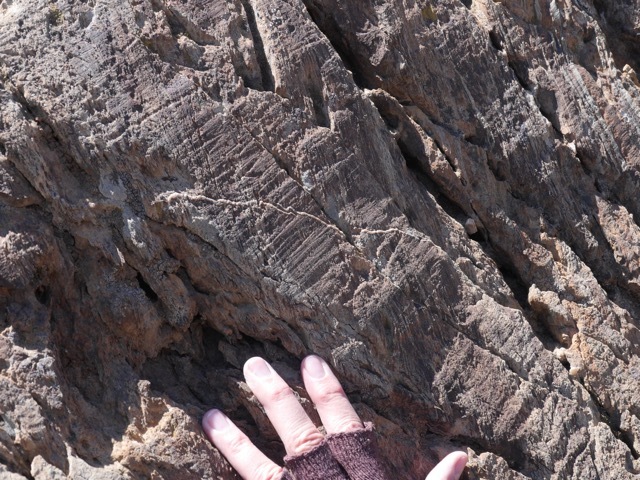 Typical outcrop of the Precambrian Nash Fork Formation. 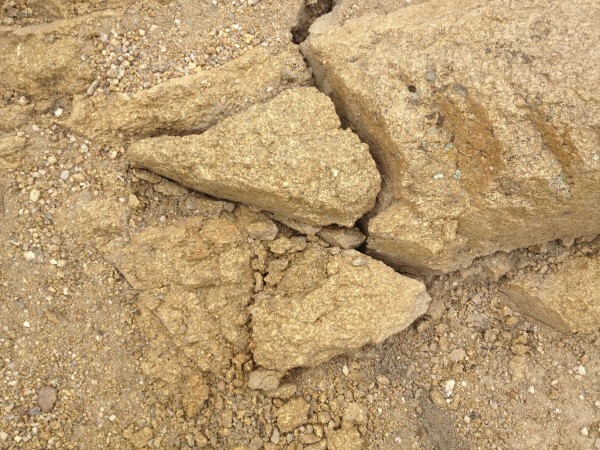 Tectonic forces have tilted the original layers into an upright position while deep-seated physical and chemical processes caused silicification (hardening) of the original lime-mud layers. Rock-bearing stromatolites of this age are uncommon and quite different than typical Precambrian rocks we find in Colorado (and in many other places). 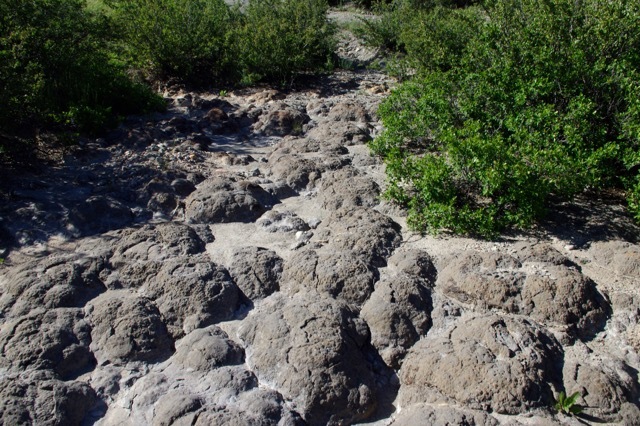 These stromatolites are essentially sedimentary in nature as they originally formed at or near the earth’s surface. Over time, they have been deeply buried and ‘squeezed’ into meta-sedimentary rocks and then uplifted -most likely during multiple mountain building events in this area. Finally, in a mere fraction of its 2 billion year old history, Ice Age glaciation (which ended about 10,000 years ago) uncovered the wonderful outcrops we visited today. Convex laminae that follow the undulations of the ancient seafloor. A great variety of shapes and forms reflect both original growth patterns as well as sliding, slumping and collapsing of the microbial/sediment mats. So now, we have a 2 billion-year old snapshot of Earth Antiquus where nothing more than simple lifeforms occupied the young Earth. A human visitor would be staring at bare rock everywhere amidst seas whose shallow margins supported the growth of thinly layered microbial mats. 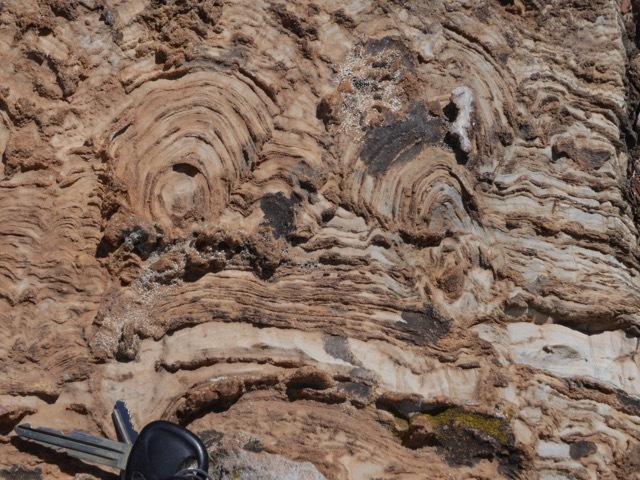 Over time- perhaps days, weeks or months, the sticky surfaces trapped lime mud into delicate wavy strata resulting in undulating domes and troughs that are the tell-tale signs of once living stromatolites. How do we know this? 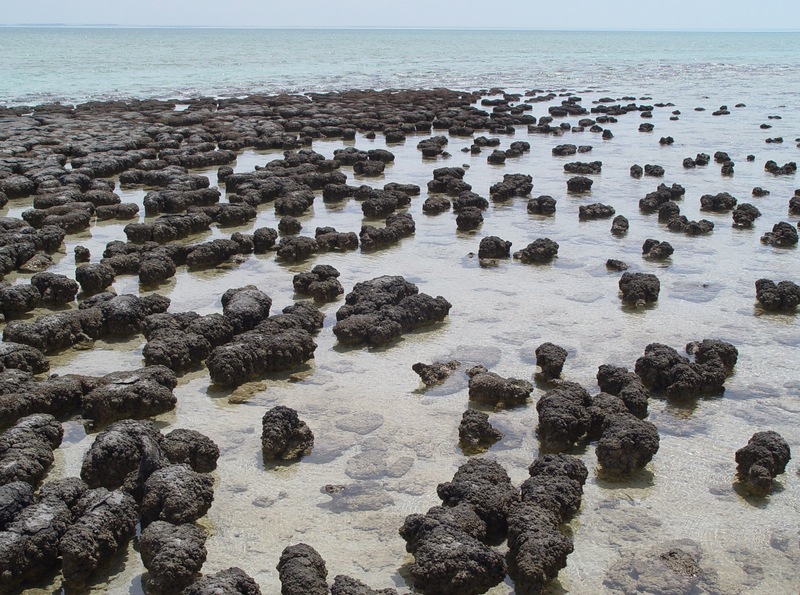 Modern stromatolites exist today in a few places that offer a glimpse into the mechanics of primitive algae and bacteria that were life’s rulers of Planet Earth for nearly 3 billion years. 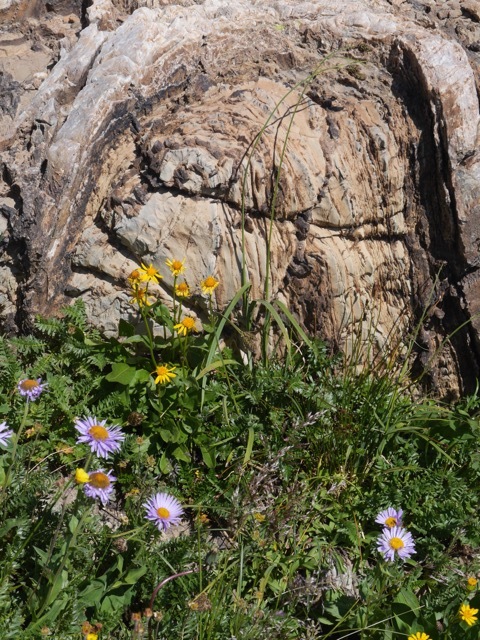 Oblique cross section of stromatolite dome contrasting 2 billion year old life with modern flowers which made their first appearance a mere 150 million years ago. So, we salute these extraordinarily ancient stromatolites as postcards of primitive Earth. Envision countless mats of slime yielding tiny bubbles of oxygen that in turn tempered Earth’s primordial atmosphere into one that could harbor more complex life forms. And maybe, just maybe these most ancient of fossils offer us a clue to our most likely alien encounter from the beyond. A self guided walking tour of the site can be downloaded from the Wyoming State Geologic Survey. Closer to home in Northern Colorado, these ancient stromatolites form siliceous (resistant) mounds as part of the Jurassic (150 my) Morrison Formation. The larger ‘heads’ are about 1 meter in diameter. Its hard to describe in words or in photos the amazing feeling of arriving at our new home at Horsetooth but all I can say is WOW. Jess and I have somehow been guided to live here although 3 months ago I couldn’t have predicted that. What we resigned ourselves to was remodeling the Benthaven house kitchen and improving our patio for a more private outdoor life. And then 5016 Holiday Drive called us home. Nine days into our adventure and we feel like we have parked a fantasy RV into the most beautiful natural spot in the world. I can’t wait to share more of this wonderful new beginning. In 2007, we visited our daughter Lindsay who was studying abroad in Valparaiso and took an adventure south to the Lake District of southern Chile. One of our favorite stops was the postcard pretty resort of Puerto Varas- some 630 miles south of Santiago. In early July, southern Chile shivers in the austral winter season- short days, long nights and plenty of snow to gaze at atop the Andes Mountains. 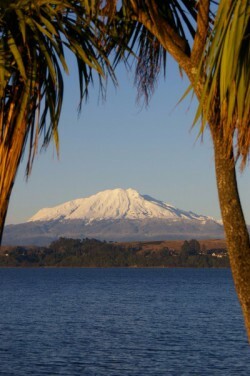 Along the shore of Llanquihue Lake we marveled at the ‘Fuji-like’ presence of Osorno Volcano and its sister peak, Volcano Calbuco. The dark volcanic sands and gravels along the waterfront are a testament to the newness of these majestic volcanoes which dominate the western coast of South America for thousands of miles. 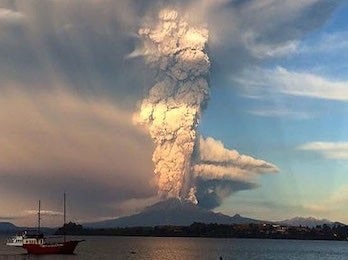 When news broke last week that the sleeping Calbuco was erupting after 40 years of quiescence, I realized we had been there and recalled the amazing scenery – a product of profound forces of nature. Its hard not to think about geologic processes when staring at my mac desktop. 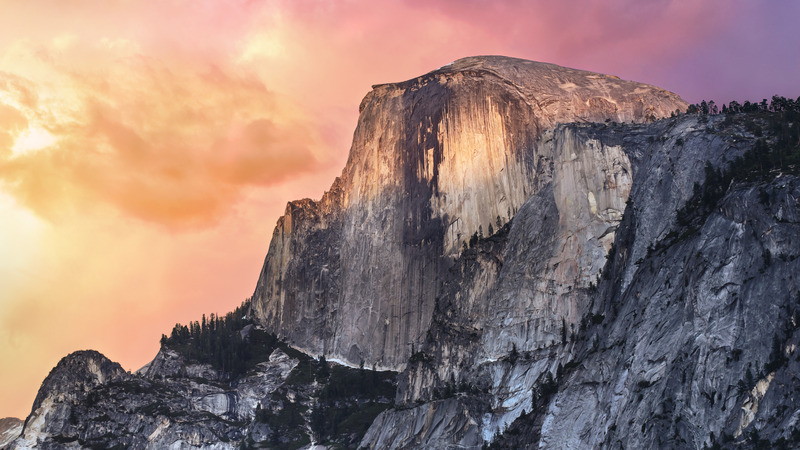 Apple’s current OS X operating system, Yosemite, sports a beautiful sunlit photo of Half Dome- an icon of geologic wonder in California’s Yosemite National Park. The Park’s magnificent scenery owes its good looks to the unroofing of a pluton (igneous rock that forms below the earth’s surface) by ancient uplift and more recently by glacial sculpting during the Ice Ages. Nearby, the formidable sheer cliff of granite, called El Capitan made recent headline news when American climbers Tommy Caldwell and Kevin Jorgeson scaled the 3,000-foot “Dawn Wall”. Check out the megapixel image featured here. Their feat was unique as they relied solely on their body strength, hands and feet during their 19 day ascent. Safety ropes were used only to break their occasional falls. There is a wonderful map of El Capitan’s south east face, showing prolific detail of the wall’s geologic features. The map features the “Nose Route” (among others) and the fine-scale mapping of various dikes and cross-cutting intrusions that make up this massive granitic structure. Thanks Apple for honoring the rock formations of Yosemite and those who challenge their breathtaking verticality. Having been a student of sand (and sandstone), I fully appreciate this creator’s wonderful explanation of the diverse and beautiful nature of sand. In the video below, weathered grains of granite make their way from California’s Sierra mountains to the Golden Gate. Here in Colorado, there are endless ways to study the origin of sand. 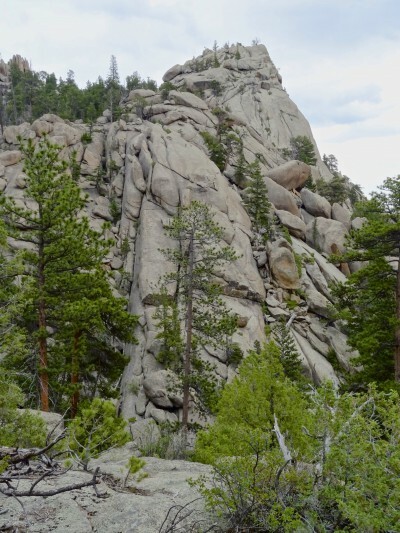 Our summer hikes to Gem Lake Trail in Rocky Mountain National Park reveal fractured and weathered granites- some of which simply crumple in your hand- the humble origin of sand from the Rockies. Courtesy USGS. 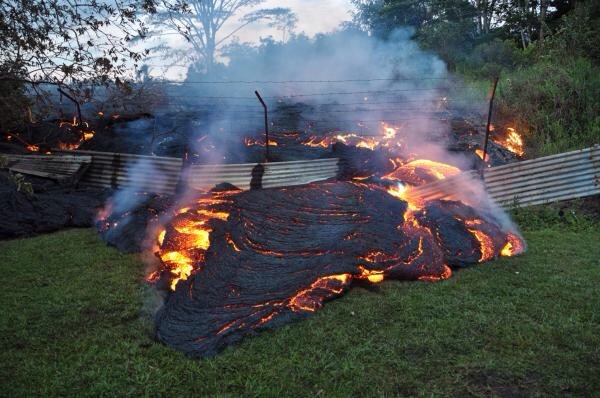 This Kiluea Volcano flow of June 27 pushed through a fence marking a property boundary above Pāhoa early on Oct 28, 2014. Here, the flow is inflated to a height around 4 feet. On the island of Hawaii, residents are all too familiar with lava flows encroaching on their properties. In 1986, the town of Kalapana was overun by flows destorying homes, vehicles, roads and vegetation- leaving swaths of unwelcome basalt throughout this Hawaiian community. Creeping at speeds of several kilometers/hour, you can certainly out-walk these- but with temperatures of active flows between 500 and 1400 C, they are extremely dangerous forces of nature. The USGS has a day by day video/photo chronology you can follow here. What I love about geology is imagining changes in our earth through impossibly vast periods of time. Some things are difficult if not outright impossible to study directly (the nature of the earth’s interior) but landscsapes afford an easier path for us curious souls. In the case of river or glacial geomorphology (geomorphology is the study of landforms and the processes that form them), the evidence for landscape evolution is quite accessible. 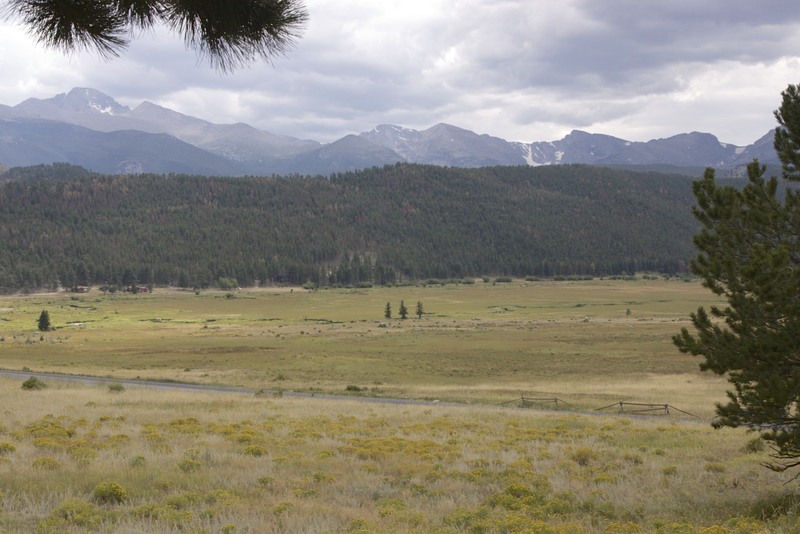 Having visited Moraine Park in Rocky Mountain National Park many times, I was always amazed and even somewhat skeptical that those heavily forested ridges are actually enormous Ice-Age piles of chaotically arranged gravel and boulders- better known as lateral moraines. Only after seeing active glaciers and their companion moraines, can one truly see how they form as rocky rubble from valley walls shoved into long ridges against the steep sides of the ice-filled valley. 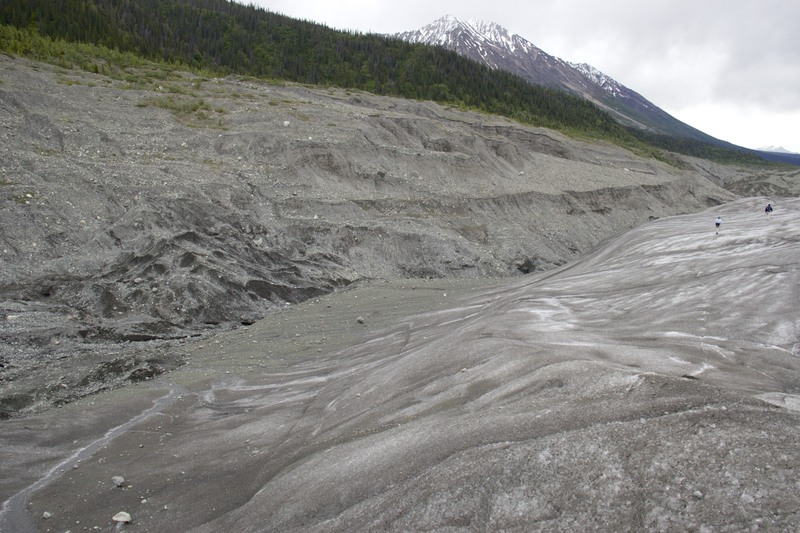 Actively forming lateral moraine near Kennecott Mine along the Root Glacier in the Wrangell-St Elias National Park. 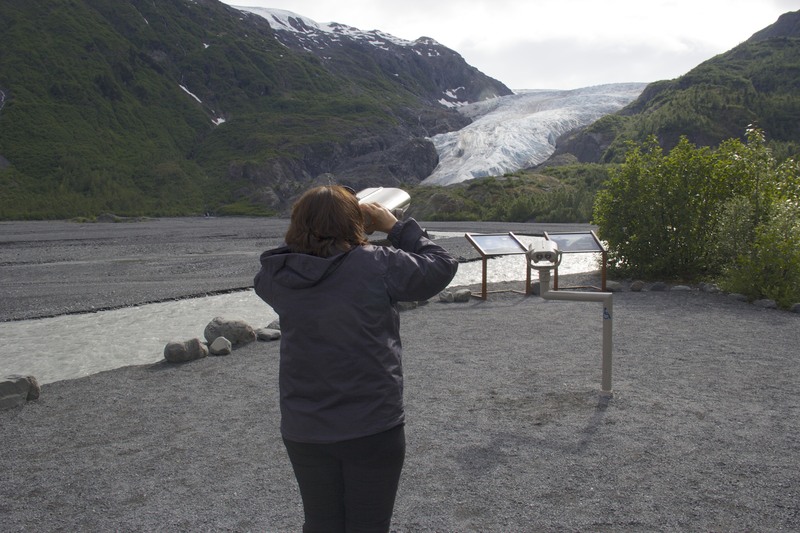 On a recent trip to Alaska, Jessica and I had the good fortune to visit glaciers- a lot of glaciers as we love to hike and explore new areas wherever we can. 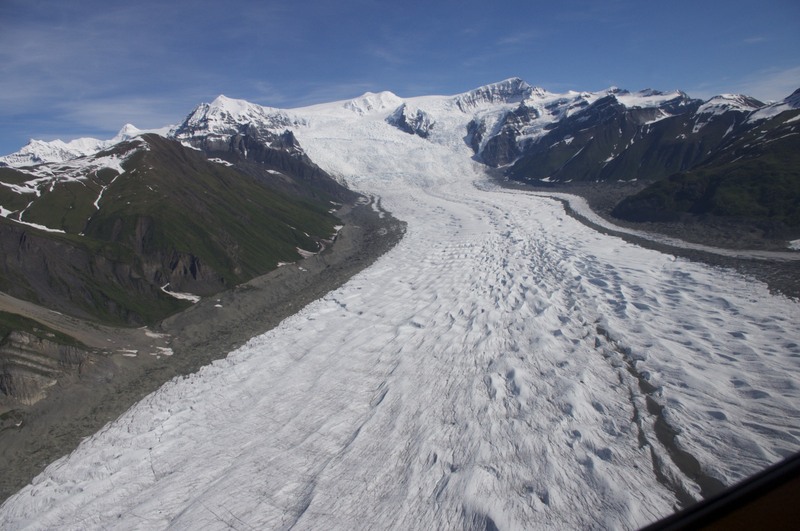 If you examine the images closely, you can see the obvious relationship between lateral moraines and their glaciers– now– today– in the present –Wow. You can even hear the rocks sliding and moving as the glacier creeps downhill in an arguably -not so glacial speed. That’s another story of course. You see, these moraines are fresh and naked of vegetation, so from the air or from the ground, their steep gray ridges are easy to spot. Jessica, who has learned to endure my commentaries like this for decades easily notices these features in Rocky Mountain National Park. We may not be able to travel in time, but we can travel in space to make these connections real and truly understand all dimensions of change on our planet. The perfect counter-pose to a year of teaching? Two glorious mornings in the field, learning about our community’s amazing geology. 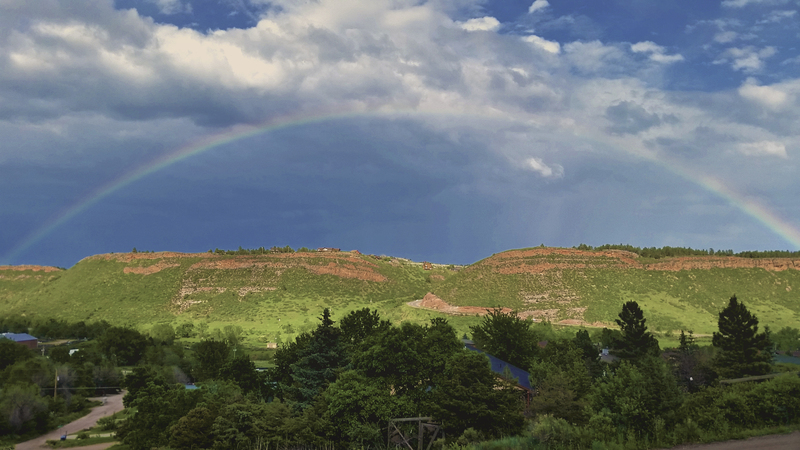 As part of Poudre School District’s Summer Institute, teachers from across grade levels and schools, joined together for a fun day in the foothills west of Fort Collins. Each of the two mornings was followed by afternoon classroom trainings where teachers used the days’ photos, video clips, and notes to construct virtual field trips for their students. Lessons included stream erosion and deposition along the modern Poudre River, explanation of mountain building, faulting and folding, and of course, the obligatory time travel. This group visited the ‘ancient’ Poudre River dating back 300 million years to the time of the Ancestral Rockies. Capping the experience was a close look at shale beds which are both economic (shale gas and oil) and a hazard (when homes are built on their unstable slopes). Thanks to Dee Dee Wright, Adam McBride and guest scientist Neil Sherrod for their support and teaching.